YKON is continuing it's collaboration with Culture Push in New York City. Seven of the participants of Culture Push's Utopian Fellowship program have each designed 1 exercise for one day of the week. This program is an invitation to practice utopian thinking and acting in everyday life. 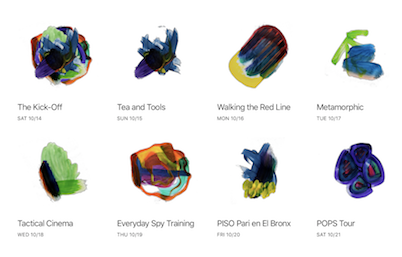 During this week-long event artists and participants will test the usefulness of the concept of Practical Utopia when it is applied to daily life through a series of exercises, prompts, and gatherings. The term “Practical Utopia” reflects the desire for large scale changes to the current system of society by initiating the first practical steps towards such changes right here and now. “Practical Utopia” insists on the necessity of Utopia as an intellectual concept interlinking the fantastical and the pragmatic in bringing about social, political and artistic change. Check details of the program here. YKON currenlty explores new collaborations with Culture Push, a New York based art organisation. As part of the program "Finland – developing country of social relations" YKON invites to PLAY HOUSE: A flat filled with dozens of people, drinks, food, music… and then what? YKON encourages guests to play and experiment with the conventions of social interaction. This evening will show whether simple, low-tech game mechanics can radically alter how people relate to each other. Welcome to the suspension, deconstruction and general messing around and reconfiguration with social interactions. Welcome to a collective journey to something else than party as usual. Welcome to Play House! This four-hour event took place in a secret location. Guests received further instructions via sms. 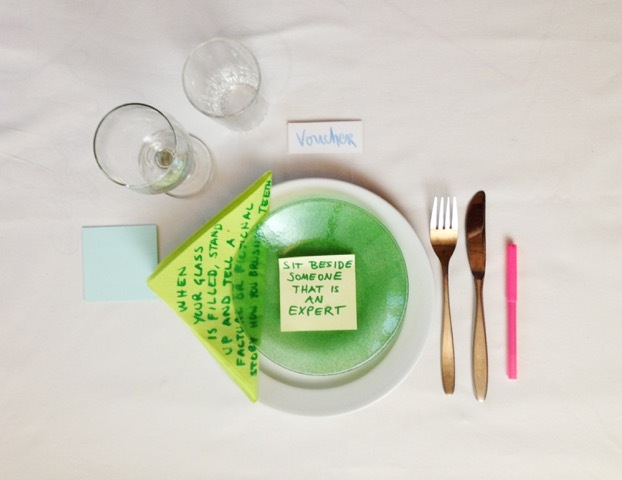 THE DINNER GAMES is a 2 day workshop playing with the social format of the dinner and developing new interactions around it. During the two-day, hands-on workshop participants will develop a dinner format from scratch. We create a menu, revisit and modify established notions of behaviors, develop new social rules, and redesign our table hardware. The project starts at the dinner table, but it's wider aim is to look at tools and tricks to transform every day activities. The elements developed during the workshop will be tested in a closing dinner event on the evening of the 2nd day. External guests will be invited to enjoy a menu of different courses and interactions. The workshop is part of the professional development workshops for artists delivered by m-cult in context of the transnational Collaborative Arts Partnership Programme and the Vastaanotto/Reception Triennale of community arts. check for more info from here. Check out the latest documentation of the Brioni Summit of Practical Utopias. Spoiler Alert: You will feel sorry about yourself if you didn't attend. Let us know if you want to join the next Summit. We are happy to launch our new open source project YKON DINNER GAME. The event is part of Performing Encounters -series, curated by Yvonne Reiners, and it takes place April 13, 2016 at 7pm, at Haus Am Lützowplatz, Berlin. The YKON DINNER is a game, designed by YKON, that alters interactions at the dinner table. By using a dinner structure of multiple courses, YKON facilitates the interaction between guests. Rules, scripts and designed hardware will encourage the conversations to go into new directions. > You could imagine the YKON DINNER as a combination of a dinner party with friends whom you haven’t met but always wanted to meet, a candy box of tools that you can take home with you and a series of close encounters with your possible futures. YKON is facilitating an international seminar about Future of Scholarly Communications, organised by Force11. The workshop brings thought leaders and new voices across disciplines and countries, in an inspiring environment and lively format to rethink scholarly communication from scratch. YKON took part in a symposium looking into educational aspects of the the Black Mountain College (1933-1957) that "developed an unprecedented prominent genealogy of artists, scientists, and intellectuals in the neo-avant-garde of the 20th century. As an educational art institution, it established performative practices of interdisciplinary learning and researching, which included at least two crucial factors: collaboration and experimentation. This unique complicity of an educational turn and the emergence of an avant-garde is of crucial interest in today’s debates on issues of education and pedagogy in art, science, and academia under precarious economic circumstances." There is more to games than the use of game mechanics and reward systems. If gamification is a capture all strategy which facilitates the datafication and commodification of everything, this does not mean that we are condemned to some sort of ludic decadence. It all depends on whom the game-like elements come to serve; while game-based data aggregation might be raising issues of concern, at the same time a new form of what we can call ‘play commons’ is strenghtenened, which relies on the abundance and sociability of play itself. YKON, together with curator Angela Jerardi (US/NL), hosted the Athens Conference for Utopian Technologies Etc. (ACUTE), an intimate 3-day conference in the center of Athens. The Conference took place as part of New Babylon Revisited (LINK:http://newbabylonrevisited.net/). 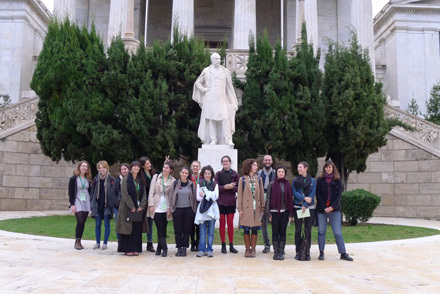 We invited participants to view and use Athens in novel and absurd ways. Game mechanics provided the methodology for engaging with the city and its existing sites and cultural infrastructure. What happens when gamification is subverted and urban elements are repurposed, when disorientation and the unexpected are embraced. 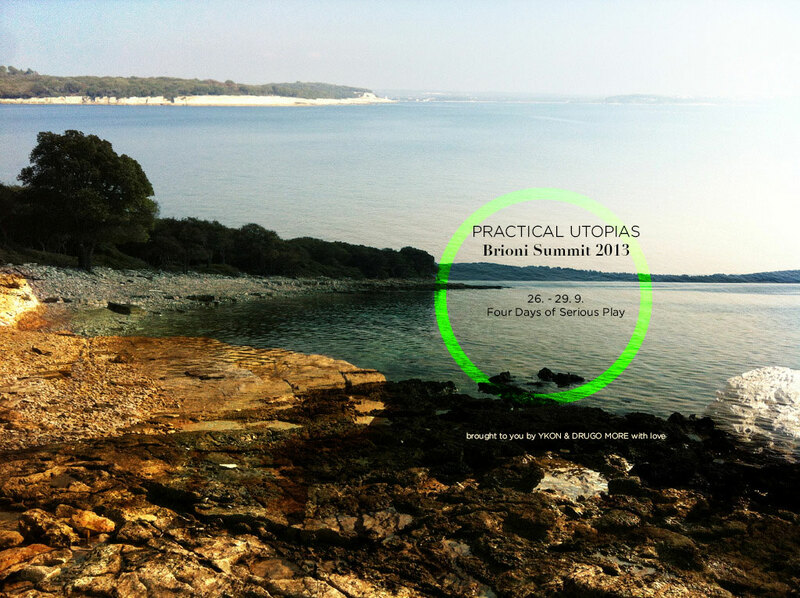 One year ago YKON organized the summit of Practical Utopias on Brioni (Tito's former summer residency island) in Croatia. Fifty visionaries spent four days exchanging their insight and ideas. 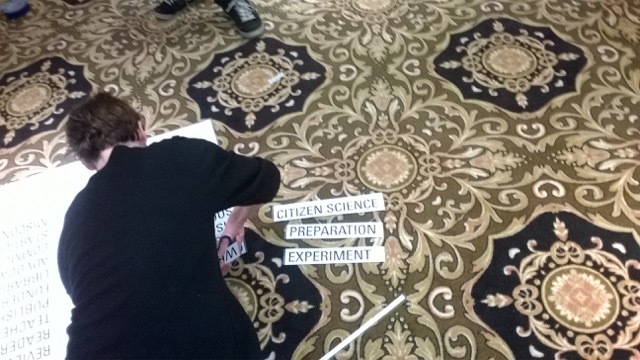 The game-like tools to facilitate interaction between the participants were made by YKON. THE BRIONI REMIXES are now YKON´s attempt to revisit and remix the remnants of this bizarre trip to a magical island. We gathered the participants' secret notebooks, audio recordings, conversations, and enlightened moments. THE BRIONI REMIXES is a party that celebrates these utopian meanderings in the practical world and share them with you. Special sonic support by Richard Thomas (UK), who documented the event in sound. The Summit of Practical Utopias was a 10 year anniversary from The Summit of Micronations, which took place in Helsinki - produced by Artist Association MUU´s Amorph!03 -festival. YKON takes part to the The 2nd CAFAM Biennale titled "The Invisible Hand: Curating as Gesture". The Biennale has 5 sections, each with an own curatorial concept. YKON is involved in the section with the nicely obscure title "Game Theory: Which Animals Are Most Like Each Other?" Curated by Angela Jerardi. Together with fellow Utopians Constant Niewenhuys/New Babylon, Experimental Jetset, Provo, Temporary Services and The Yes Men. More info on the Biennale here. Brioni Summit is soon here!! After a first test-game in Helsinki we will try new elements of the game we currently develop for the Brion summit. Testers are welcome, Theaterhaus Mitte in Berlin, from 3 to 7 pm. For the beloved Mine-Yours-Ours Festival in Rijeka YKON organized 3 different games; Utopian Bingo for locals, a "classic" YKON game for kids (while parents where playing BINGO) and one game for 20 performing arts organizers that were invading Rijeka before heading to a conference in Zagreb. Electra and SPACE present a great Midsummer event with YKON. We will play a new version of the YKON game called Utopian Bingo (working title), there will be an exhibition of works by YKON, by Ulu Braun and by Tellervo Kalleinen/Oliver Kochta-Kalleinen. The evening will continue with a tent-sauna, BBQ and a late night outdoor cinema, right at the canal at the White Building in Hackney Wick. YKON will spent May until July in London in various constellations. YKON will be hosted by the new international residency program Permacultures run by London based arts organisation SPACE. A goal is to map current practical utopias related to London or the UK. YKON will also develop a new dedicated website for the groups gaming activities. YKON joined a great rooster of artists at the communikey festival in Boulder / Colorado. As the name of the festival suggests, it is a very relaxed, community oriented festival, with volunteers cooking for festival participants, laid back afternoon sessions and excessive dancing nights. The rather optimisitc theme for the 2012 edition of the festival was MicroTopias. It suggested to artists and festival attendees that we can create the world(s) that we want to live in. As the organizers put it: "MicroTopias can range from an instantaneous magic moment between individuals, to an orchestrated collaboration between hundreds. Whether temporary or long-term, consciously created or spontaneous, these are the spaces that emancipate us from our self-imposed limitations. Not out of the ordinary, but definitely extraordinary, MicroTopias are not one universal utopia, but rather small pockets of possible futures, built from creativity, play and chaos. They are about giving ourselves the permission to create a multiplicity of topias that actualize an infinitude of possibility for dreams and dreamers to flourish." In this context the YKON game provided a good tool to discuss a wide range of future scenarios. In one fairly sophisticated scenario time was re-designed and modified into so called "fuzzy time". For the game the very positive mindset of the festival had a slight negative side-effect since nobody wanted to play the villain that would have challenged the altruistic mood. 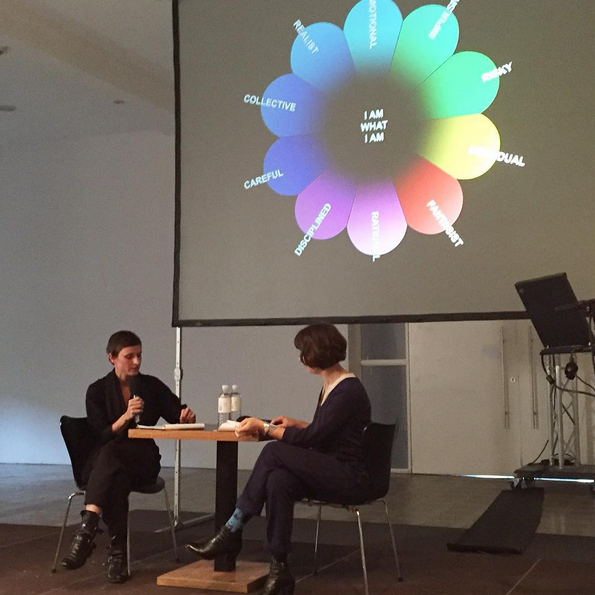 We also gave a talk at the University of Colorade Arts Department on particpatory art practices (and the inherent pitfalls). 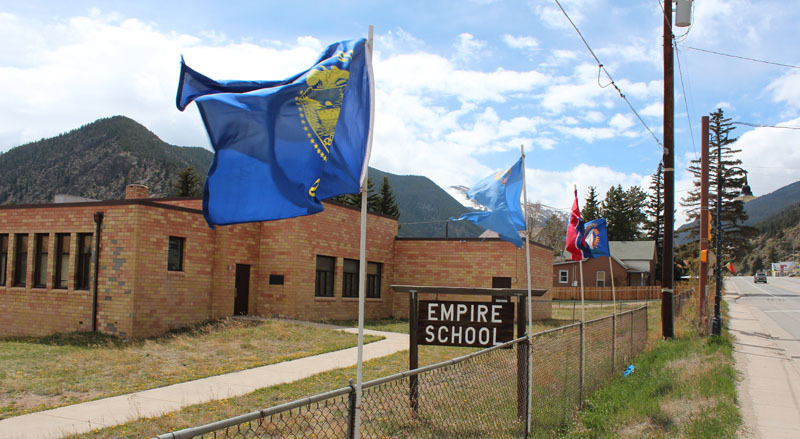 After the festival we made a short pilgrimage to the small town of EMPIRE in the Rocky Mountains. Btw. the local school (pictured above) is on sale. We also visite the school in South Park, which is going to be demolished. For further information visit the communikey festival website. Macht mit bei diesem dynamischen, performativen, modularen, experimentellen, optimistischen, edukativen und utopischen Gemeinschaftsspiel! Basierend auf Buckminster Fullers «World Game» nimmt YKON die SpielerInnen in Zürich auf eine bizarre Reise, in der die Welt unwiderruflich und radikal verändert wird. Wo wurde das YKON Game schon gespielt? In Wien, London, Boulder, Split, Porto Alegre, Paris, Tallin, Athen, Berlin, Weimar, Rijeka, Reykjavik, Helsinki und jetzt endlich in Zuerich! 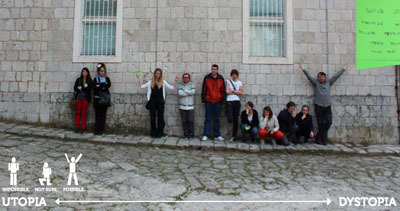 In the context of the Interaction Design Workshop (Department of Visual Communications Design (DVK) Arts Academy, University of Split) YKON hosted a 1 week development event for participants across various disciplines to critically reflect upon, adapt and expand on Buckminster Fullers World Game and it's contemporary predecessor - the YKON Game. After a series of micro-games particpants developed a game called Brain-Blender and a note-book with a handy focus shifting tool-kit. It consisted of simple stenciled cards that focussed the attention; for example to poor design, or dog-poo. YKON invites people from Vienna join the YKON GAME, a beautifully bizarre journey & collective attempt to alter the World. Instead of solving the common problems that we are facing, The YKON GAME seeks to uncover the ideas that we haven’t payed attention to yet – ideas that are sometimes wonderful & sometimes terrifying. Other thoughts that could forever alter the world & the way we live in it. The YKON GAME is based on a simple thought experiment: Imagine that the world is brought to a complete halt. Everything stops. No more business as usual. Everyone has to consider a new way for things to be. With the world being frozen, you &your fellow players can tinker with the world as you please. What will you change? How do you convince others to go along with your changes? And what about the consequences? Through the 1960’s architect &utopian thinker, Buckminster Fuller developed the “World Game”. It was his master plan for our planet Earth. A tool that would formulate a comprehensive design & science approach to all the problems of the world. Inspired by Fuller’s vision we have taken its core ideas & developed a contemporary, poetic & YKONic version to provide a new perspective on the future of our world. Datum: THU 19.01 & SAT 21.01. 2012. 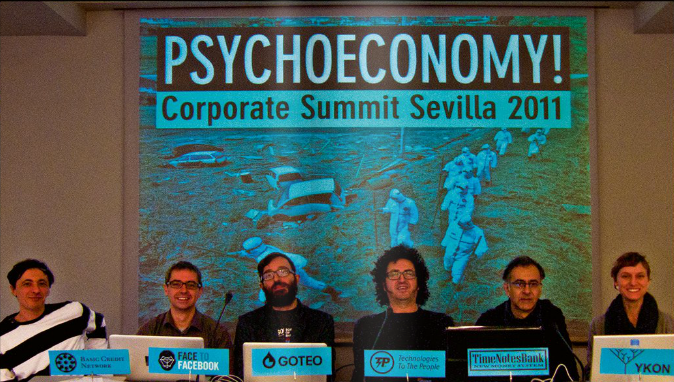 "Bring your friends, your colleagues, your aunt... you do not need to be an expert: Everybody is welcome to change the world"
YKON participated in the 2011 Psychoeconomy Summit in Sevilla in December. Together with 5 other delegates the current status of our psychoeconomy was discussed. The three-day gathering resulted in a fresh declaration for our immediate future – valid as of now. You can download the declaration here. Within the framework of the 8th Mercosul Biennale dedicated to the topic of "Geopoetics", YKON presents two pieces, the "YKON game" and a new work "The Flag Piece" commissioned by the Biennale. For "The Flag Piece" all the 204 Flags of UN-recognized countries where cut into their single color elements and symbols (Stars, Moons, Eagles..). 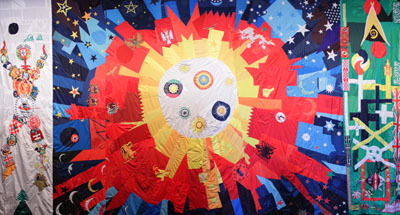 In collaboration with a local seamstress cooperative the elements were re-united into a giant single transnational flag (915 cm x 480 cm). The flag is accompanied by a selection of international flag laws and stories about flag desecration. YKON game was developed 2009 - inspired by Buckminster Fuller´s World Game. YKON GAME – also nominated for the DMY Berlin Design Festival prize 2011– is a beautifully bizarre journey and collective attempt to alter the World. Instead of solving the common problems that we are facing, The YKON GAME seeks to uncover the ideas that we haven’t payed attention to yet – ideas that are sometimes wonderful and sometimes terrifying – other thoughts that could forever alter the world and the way we live in it. YKON developed for the Mercosul Biennale a new version of the YKON-game. The game will be played daily throughout the biennale in a special constructed geodesic dome. Entitled Essays on Geopoetics, the 8th edition is concerned with territoriality and its critical redefinition from an art standpoint. It will bring together 105 artists from 31 countries that develop relevant works regarding the notions of country, nation, identity. The exhibition has 7 parts, the main exhibition is held under the title Geopoetics, presenting works and artists that question the notion of nationality. Another part of the biennial, entitled Travel Notebooks – features artistic expeditions to nine regions of Rio Grande do Sul between April and August. The 8ª Mercosul Biennial will be open from September 10th to November 15th 2011. 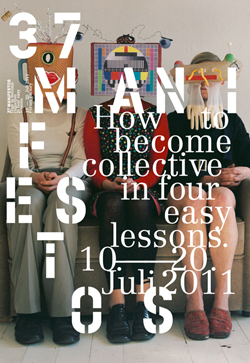 37 MANIFESTOS - How to become collective in four easy lessons. Artists Anonymous, Berg26, Club Real, Edition Taube, FAMED, Familie Kartenrecht, Klub7+44flavours=MAUER51, ligna, Nos Restes, REINIGUNGSGESELLSCHAFT, Transidency, VIP, YKON, Zentrum für politische Schönheit. Das Kollektiv ist zurück. Geteiltes Wissen, gemeinsames Handeln, vernetztes Arbeiten, Selbstorganisation und Kollaboration haben Einzug in Kunst, Kultur, Wirtschaft und Politik gehalten. Durch die weltweite Gründungswelle künstlerischer und kreativer Kollektive seit Mitte der 90er Jahre erfahren kollektive Arbeits- und Lebensformen wachsende Bedeutung. Während Strategien der Kollaboration neue künstlerische Wirkungsfelder in Wissenschaft und Gesellschaft eröffnen, lassen sich aktuelle Kollektivierungstendenzen auch als möglicher Gegenentwurf zu den gesellschaftlichen Mustern von Vereinzelung, Prekarität und Konkurrenz lesen. The YKON GAME will be presented at this years DMY International Design Festival in Berlin and is nominated for the DMY Award: "Das YKON Künstler-Kollektiv hat ein Spiel für ca. 30 – 50 Teilnehmer entworfen, das darauf abzielt, globale Ideen zu entwickeln, die verborgen geblieben sind: mal wunderbare, mal erschreckende Gedanken, die das Leben für immer verändern könnten." YKON artist collective has created a world simulation game for up to 30 -50 players. Day 1 and 2. Every hour, you can enter the world, the attic of make–believe, trough fragments, small teasers, of the YKON Game. The full version of the YKON game will be played on the third day of DMY Festival, in a hitherto unknown location. Instead of solving existing problems, the game seeks to uncover ideas that we’re still missing – sometimes wonderful, sometimes terrifying thoughts that could forever alter the world. YKON prepares a new meeting of micronations in Brasil at an yet undisclosed location. Updates will follow soon. We invite you to play a game with us on the 20th june at Eof Galery from 14h to 19h. The YKON Game is a world simulation game for up to 30 players. It's based on a simple thought experiment: imagine that the world is brought to a complete halt. Everything stops. No more business as usual. With the world frozen, you and your fellow players can tinker with it as you please. What will you change? How do you convince others to go along with your changes? And what about the consequences? Through the 1960's, Buckminster Fuller was developing the "World Game". It was to be his masterplan for the planet Earth: a tool that would formulate a comprehensive, design science approach to all the problems of the world. Inspired by the ideas of Fuller, we have developed the YKON Game, a more poetic perspective on the future of our world. Instead solving the problems that we know, The YKON Game seeks to uncover the ideas that we're still missing -- sometimes wonderful, sometimes terrifying thoughts that could forever alter the world, and the way we live in it. For its players, the game poses an existential challenge: they will have to think about what kind of world they truly want. So come and change the world. You don't need to be an expert: everyone is welcome. For more details check the YKON GAME F.A.Q. The game is run in English and French. It will be played from 2 to 7, then a debriefing and friendly food & drinks break before the Mal au Pixel opening event. The proposed scenarios will be documented and added to the Ykon Game corpus (already 9 parties so far). We invite you to play a game with us on Saturday, December 19 at Hafnarhusid from 12:00 to 17:00. Four members of YKON have arrived to Iceland to spent some time in Reykjavik at the SIM artist residency. For YKON the current situation in Iceland is of special interest; the group will facilitate a new version of the YKON game hoping to generate amazing ideas for desperate times. Overwhelming variety of programs! Throw your darts to choose! a simple thought experiment: imagine that the world is brought to a complete halt. Everything stops. No more business as usual. With the world frozen, you and your fellow players can tinker with it as you please. What will you change? How do you convince others to go along with your changes? And what about the consequences? Through the 1960's, Buckminster Fuller was developing the “World Game”. It was to be his masterplan for the planet Earth: a tool that would formulate a comprehensive, design science approach to all the problems of the world. Inspired by the ideas of Fuller, we have developed the YKON Game, a more poetic perspective on the future of our world. Despite the most harsh weather conditions imaginable the YKON game was played relocating the game several times. 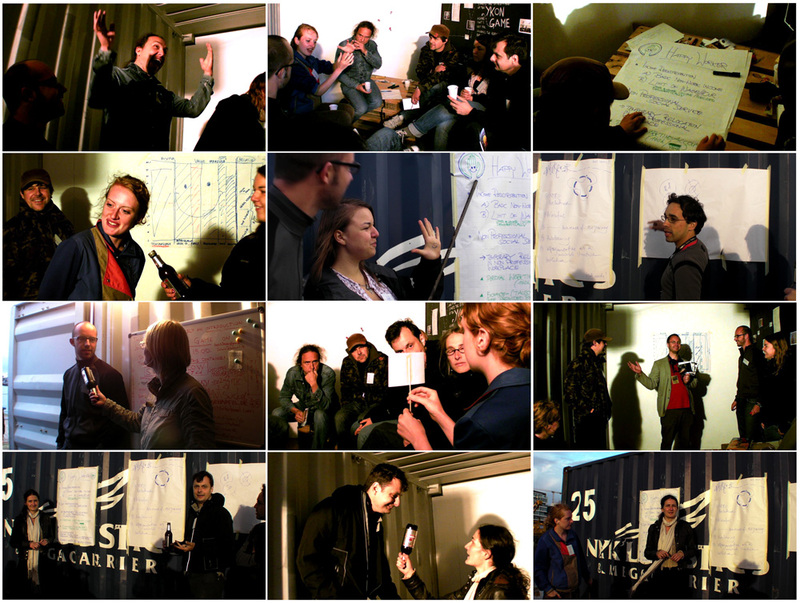 After initial confusion 8 players were crammed in a standrad 20 feet container developing various scenarios; one group named HAPPY WORKERS tested the idea of basic income in relation to democratically decided upper/lower limits for wages per workhour. This scheme was accompanied by a global social service in which workers would spent 4 weeks of their work life per year in work places outside of their original profession. Here you can see a few images from the game in Hamburg. Thanks to all players for their endurance. Are you facing annihilation? Join YKON and other uncommon comrades in arms for a day of speculative scenario development and alternate future writing. The YKON Game is a world simulation for up to 30 players. We put the world “on hold” for 6 years. You can tinker with it as you please. What will you change? How can you seduce others to go along with your changes? This game will uncover the daring, breathtaking, sometimes wonderful, sometimes terrifying thoughts that could forever alter the world, and the way we live in it. The game process will reveal uncertainties of the presence and open up lateral thinking about the future at the same time. The YKON Game was inspired by the World Game by Buckminster Fuller and reminds some people of Douglas Adams´ equally famous Restaurant at the End of the Universe. The game was developed in a collaboration with Pekko Koskinen. Welcome! Bring your friends, your colleagues, your aunt ...you do not need to be an expert: everyone is welcome. Are you facing annihilation? Time for a cup of tea? Join YKON and other uncommon comrades in arms for a day where everything is possible. Our destination? 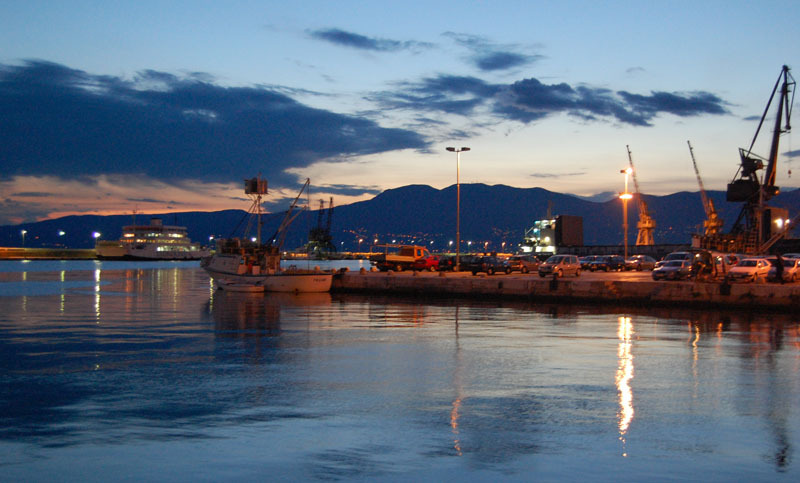 The Faliro Beach: the ultimate hotspot for a total Earth makeover. The YKON Game is a world simulation for 12 to 25 players. We put the world “on hold” for 6 years. You can tinker with the world as you please. What will you change? How can you seduce others to go along with your changes? And what about the consequences? The YKON Game is a combination of the famous World Game by Buckminster Fuller and Douglas Adams´ equally famous Restaurant at the End of the Universe.This game will uncover the daring, breathtaking, sometimes wonderful, sometimes terrifying thoughts that could forever alter the world, and the way we live in it. Your thoughts: our world! The game was developed in a collaboration between YKON and Pekko Koskinen. Welcome ! Bring your friends, your colleagues, your aunt ...you do not need to be an expert: evryone is welcome. YKON have been invited to look into the Dr. Tsironis case. On June 14. 2009 a delegation from YKON will meet with representatives from the Errands group in order to decide on the initiation of an international investigation into the strange case of Dr Tsironis. A special delegation from the state of NSK will also attend the meeting. Dr. Vasílis Tsirónis 1929-11/7 1978, was an interventionist voice that in 1978 declared his apartment in Athens an autonomous state: NNF (Neutrophile National Front). On July 11 the same year the state was invaded by Greek police. The head of state, Dr. Tsironis, died during the attack. Even though there are earlier records of attacks on micronations - such as Great Britains attack on The Kingdom of Sealand, and Swedens attack on the Remony of Ladonia - according to YKON’s historical records this is the first time a citizen of a micronation has died during an attack from a foreign state. invites you to take part in the YKON Game – Saturday, January 31. RSVP info@ykon.org. YKON will offer refreshments and drinks. The YKON Game is a world simulation game for 12 to 25 players based on a simple thought experiment. Imagine a world that is brought to a complete halt. Everything stops. Only you and your fellow players can roam around freely and tinker with Spaceship Earth at your will. Everything is possible. What will you do? And what happens when the world is getting back into motion? You don't need to be an expert. Just to take part is enough. The YKON Game is a modern variation of the famous World Game developed by BUCKMINSTER FULLER in the 1960s. Fuller's idea was to create a subversive tool to "make the world work for 100% of humanity in the shortest possible time through spontaneous cooperation without ecological damage or disadvantage to anyone." The game was developed in a collaboration between YKON and Berlin based maverick artist Ulu Braun. The first prototype of the YKON game was launched and tested during Lens Politcia in Helsinki. 10 players joined the game workshop to test the different stages of the game. The game is a thought experiment in which the world comes to a complete hold. Players can tinker with Spaceship Earth for 6 years at their will. According to each players preference they will develop a utopain, a pessimistic or a fantastic scenario for the world. This years Helsinki Biennale was organized as a secret World Fair in the cellars of Designmuseo. YKON was happy to represent the Antarctic continent at the fair, since this territory is a hotbed of activities for micronations, Utopian tinkerers and other fictitious travellers. 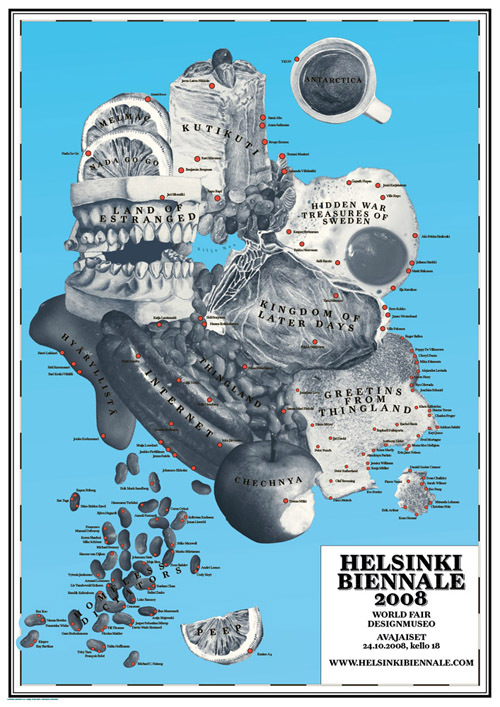 The poster of the Biennale is a funny psychedelic world map. "The world may need more than your love"
Welcome to solve the world's problems. All of them. In one day. YKON invites you to take part in a Future Game facilitated by renowned Medard Gabel. Saturday 5, April, 10.30-19.00. YKON will offer lunch and drinks. The Future Game is part of YKON's first exhibition in Finland at Taidehalli, 4.4.-to 6.4. The artist group will give an overview of its recent international activities. Among the works included in the show are "Recognize Me!" – Micronations recognize Taiwan – produced for the Museum of Contemporary Art Taipei and "M8-Singapore Summit of Micronation" commissioned by the Singapore Biennial 2006. THE FUTURE GAME is a fast-paced multimedia simulation for 10 to 200 players that places you in charge of the future. The FutureGame - designed by BigPictureSmallWorld - is a modern variation of the famous WorldGame developed by Buckminster Fuller and Medard Gabel. Fullers idea was to create a subversive tool to "make the world work for 100% of humanity in the shortest possible time through spontaneous cooperation without ecological damage or disadvantage to anyone." MEDARD GABEL is the founder of BigPictureSmallWorld and the former Executive Director of the World Game Institute which he started with Buckminster Fuller. He is also known as the founder of the Encyclopaedia of World Problems Global Recall. In his work with Buckminster Fuller, he learned the power and utility of whole systems thinking, global perspectives and a good sense of humor. Gabel is the author of six books on global energy and food problems and solutions, environmentally sound planning methods, the global impact of multi-national corporations, and global sustainable economic development. He is for example auhtor of "Global Inc. - An Atlas of the Multinational Corporation." YKON is an artist-run non-profit advocacy group for experimental countries and utopian thinkers. YKON evolved from the Amorph!03 Festival "Summit of Micronations" produced by Artists' Association MUU. The current members are Sasha Huber, Tellervo Kalleinen, Oliver Kochta-Kalleinen, Petri Saarikko and Tomas Träskman. The Project is kindly supported by Taidehalli and KIASMA. FOR THE BRIONI TOP SUMMIT OF MICRONATIONS (AND OTHER ANTI-ANTI-UTOPIANS) HELD ON THE BRIONI ISLAND IN CROATIA IN THE YEAR 2013, YKON IS NOW CALLING FOR IDEAS, PROPOSALS, PAPERS, DECLARATIONS OF INTEREST (OR INDEPENDENCE), SECRET MESSAGES, ARCHITECTURAL PLANS, GOOD PRACTICES, LOVE LETTERS, HISTORIC TREATISES, AND OTHER DOCUMENTS FROM THE FUTURE. We call YOU: peaceful mediators, psychedelic facilitators, social inventors, alien helpers, micronational achievers, autonomous space-invaders, co-operative bolo bolos, stealth designers, commited magicians, pensioned spies, utopian world-champions, transnational citizens, optimistic panarchists, light-hearted architects, participatory economists, libertarian municipalists, non-aligned revolutionaries, cross-disciplinary tinkerers, innocent visionaries, communal transcendentalists, voting-system plumbers, footnotes of history... and all those in search of the blueprints for the future. WE INVITE YOU TO CREATE THE BRIONI SUMMIT OF MICRONATIONS TOGETHER WITH US! YKON will have a short appearance at the open air campo event with the wonderful title: "The Future of Welfare"
YKON present their works and operations in four different locations this spring. Palais de Tokyo, the Finnish Institute in Paris, Main D’Ouvre and Le French May in Hongkong, all host this artist group from Finland. In one of the most prominent of art institutions in France, Palais de Tokyo, YKON, joins forces with a number of artists in the exhibition “News from the upside Down” (01.02-06.05.2007). Sign Up! Travel with YKON.